A good and healthy mental health is much more than just the absence of mental problems. A healthy mind is one that has the power to think rationally. With a calm and fulfilled mind, a person can flourish and enjoy life to the fullest. I would define good mental health as a state of mind where one is not too affected with happiness or sadness. Loneliness is sad and alone feeling that says that you are all by yourself and isolation is when you are separated from the other people like your friends, relatives or your environment. People experience lineless or isolation at some point in their lives, these are normal feelings and they pass with time but if you don’t deal with them for long period of time, they can have a negative impact on your mind. If you feel lonely or isolated, try to surround yourself with the people you like being with, you can also think of taking up a hobby and perusing it, this will help in diverting your mind and you will feel better. The feeling of getting neglected starts from your childhood. Kids that are loved and cared for have better confidence and they don’t have the need to get anyone’s attention. However, if you feel unloved, you will constantly strive for people’s attention so that they give you their time, love and affection. If you feel unloved, look around and talk to the people who really matter to you, if they care for you, they will understand what you are trying to say. If people around you don’t understand you, talk to yourself and create your own foundation and tell yourself that you will do just find even if people don’t give you attention. The feeling or grief or loss might come from different situations like death of a family member or a loved one, the end of a relationship, loss of a job, separation from friends or family etc. Other factors that may lead to the feeling of grief include shock, sadness, anxiety, anger, guilt etc. You will need time to overcome the feeling of grief. The best way to deal with this feeling is to have a conversation with yourself, to come to terms with yourself. Don’t leave any unclosed chapters within yourself, don’t give yourself false hopes about anything, your intuition knows when something is over, it’s over! don’t try to create some other reality for yourself. When you start accepting the truth, it will be painful for you in the beginning cause you don’t want to accept it but gradually your mind will understand and you will start feeling better. You can also contact betterhelp.com for advice related to depression or any problem that you are facing. People at Better Help believe that you deserve to be happy and they will help you find a solution to your problem. You can have a counseling session with them that will be convenient, private and confidential. If there is domestic or family violence in your life, you feel scared, unsafe and powerless as a result of the behavior of someone close to you. Throughout the day, there is a constant fear in your mind that you are not safe or you may be attacked anytime. This is certainly not a good feeling to live with! Domestic or family violence may include physical harm, social stalking, physical stalking, emotional harm/blackmail, verbal harm, sexual assault or cultural harm. If you are going through any of this, you are in danger and you need to do something about it immediately. Think about this – <<twitter formatting>>you have fear inside you right now, anyway you are living with fear, so the next time you think of backing off, don’t do that, take a step forward.<<twitter formatting>> Talk about this situation to someone who can take you out of this, it might be some authority, any institution, a close friend or a family member. Talking about your situation to the right people will help you in finding solution to your problem and it will help you to move towards liberation. People usually associated exercise with their weight, but it’s not just that! Exercise goes beyond controlling your weight and physical health, exercise has an impact on your mental health as well. For instance, go running or brisk walking for half an hour and you will start feeling great and fresh when you are done, now imagine if you feel like this every morning! A good amount of exercise has huge benefits and when it comes to your mental health, exercise is equivalent to taking antidepressants. Daily exercise also helps in reducing the muscle pain thus it is great for the people who feel restricted by body pain. Now, if I say exercise, it does not mean that you should have a fix schedule about hitting the gym or jogging, do what makes you happy, you can brisk walk, swim, dance, do aerobics, work out at the gym or anything you like, the motive is that you should feel good after exercise. If you haven’t incorporated any form of exercise in your daily routine, do it right away and see the difference for yourself. 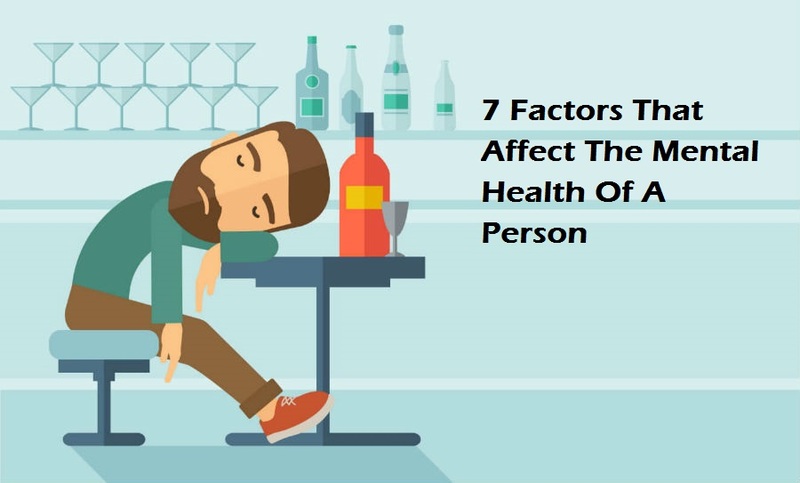 Lack of sleep is also a huge factor that affects the mental health of a person. If you are not able to sleep properly, you will find it difficult to concentrate on your work and you will end up feeling drowsy and lazy the whole day. It is extremely important to have a regular sleep schedule. Make it a habit to go to sleep at the same time every day and your body clock will adjust accordingly. By establishing this routine, you will notice that you won’t take a long time to fall asleep. Proper sleep leads to big mental health improvements and makes you feel lively and fresh for the whole day. Next story How To Deal With Anxiety And Fear?